This under-the-counter deposit drop box, Model USSDB-100, is a small drop box designed for cash, checks and small envelopes. 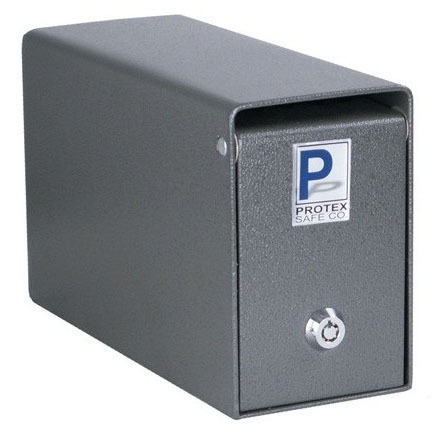 Features: 1/2" Solid steel hinge/dead bar to prevent removal of the door, saw-toothed baffle to protect slot, 1/8" welded steel structure, tubular-style key lock with double "D" configuration (can be retrofitted with other cam locks), safe comes with 2 (two) keys, powder coated grey finish, anchoring hardware included, 4 pre-drilled anchoring holes (Bottom). Specifications: exterior Dimensions - 4” W x 6” H x 10” D; interior - 3-3/4” W x 5-3/4” H x 9-3/4” D; door clearance: 3-1/2” W x 3-1/2” H; drop opening - 3-3/4” W x 7/16” H; door thickness: 1/8”; cubic inches - 210; weight: 7.5 lbs. This under-the-counter deposit drop safe, Model USSDB-100, is a small drop box designed for cash, checks and small envelopes.